What to Look for in a Trainer? Many people spend less time looking for a dog trainer than they do looking at a new car. The trouble is, if your dog has a bad experience in a training class or with a trainer, it might affect his future training performance or learning. I had a very bad experience when I was child. I took my adult German Shepherd dog to a standard fare training class that was held behind a local pet store. My parents didn’t know anything about the trainer, but I wanted to start training my dog. The first couple of sessions went well as he was good at sitting and was a natural walker. The night of down became problematic as my dog simply didn’t want to lie down and wasn’t understanding what was being asked of him. The trainer chose to have me come to the center of the circle and asked me to hand her the leash. She proceeded to try and force him to lie down, which didn’t work, and he responded by growling at her. She hit him across the face and handed him back, although his response wasn’t wrong given the circumstances. What did that teach? Well, that was the last class we attended there, and he didn’t know down. In fact, it took me A LONG time to eventually teach him down since he had such a bad experience. A good trainer should never, ever hit a dog, and she clearly didn’t have any understanding of learning or she would have known how to actually teach him. It did teach me what a class and instructor shouldn’t be like! Experience: Only someone that has experience with a wide variety of dogs (all ages and breeds) will know some of the differences that occur between breeds. Education: Someone that has taken the time to understand learning theory will understand not only how dogs learn but will know the best way to teach concepts. Adaptable: Not all dogs learn the same way. While a method of instruction might work well for a majority of dogs, it might not work for every dog. A trainer needs to be adaptable enough to figure out another method to try until the right one works. Good Communicator: The instructor should be a good listener so that your concerns are addressed properly but should also be good at communicating concepts to you too. Dog training classes are more about training the human students than the dogs, and if the instructor can communicate concepts well for you, it won’t be of much value. Availability: Most trainers don’t have a large amount of time to answer questions or talk following a class, but a trainer should be receptive to talking to you on the phone or answering e-mails. Qualifications: The main way to know if someone has spent time learning about training and dogs is to ask about their certification. Not all trainers choose to be certified or qualify to be so, but you should look for someone that is. The primary certifying body, at least in the United States, is the Certification Counsel for Pet Dog Trainers. It is advisable to speak with several trainers before settling on just one. This gives you the ability to ask questions, find out more information about the trainer and the classes, and get a good feel for the person. Most trainers will also allow you to sit in on a class or visit the facility prior to enrolling, if desired. How to Find a Dog Trainer? There are dog trainers to be found all over the place. The closer you are located to a larger city, the more options you will have available to you. You are likely to find a trainer affiliated with local pet stores or park and recreation departments within a city. Internet search: Just about everyone has a website or a Facebook page to promote their dog training business. You’re likely to find a few options around you. Professional Dog Training Membership Groups: The Association of Pet Dog Trainers is one such group. Their website includes a directory for dog trainers that you can search through. The group has the largest membership base in the United States, but there are international members from 26 different countries in the world. To be a member, someone must agree to a standard of training. 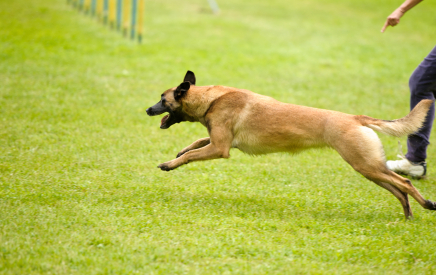 Kennel Clubs: Kennel clubs often offer classes taught by competitors within the sport. They commonly offer obedience classes, but they also sometimes offer a variety of classes like agility too. Veterinarian, dog businesses: If you have a good relationship with your vet, groomer, pet sitter, or other dog related business, be sure to ask that person for a referral. Most dog professionals have experience with other people in the area, and you might find someone locally this way. Rescue groups or animal shelters often know local trainers too. A Class, Private Training, or Board and Train? There is more than one training option available to you and your dog. What option is best really is up to you, your lifestyle, and your needs. 1. Classes: For the average puppy, a class is a great way to go because it allows you instruction, but it also gives your puppy the opportunity to be in a new environment, learn to work around distractions, and visit with new people or dogs before or after class. That being said, not all dogs should be in a group setting class. If your dog is fearful or very timid or has aggression issues, the group classroom is likely not the best environment. 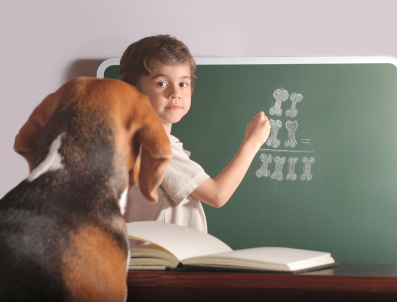 The dog won’t be able to work on learning, it could be very stressful, and it might set your dog back a great ways. 2. Private Training: Working one-on-one with a trainer can be a great option if you prefer to work from home at times that might be more convenient for you. This helps you ask questions and focus on what you really want to work on rather than a set curriculum. Plus, if your dog is having behavioral issues or a classroom isn’t a good choice for your dog, private training can be very beneficial at working through the problems more efficiently. 3. Board and Train: This option is where you give your dog to a trainer, and the dog stays with that trainer for a period of time, typically 2-6 weeks. Many people like this option as they receive a well trained dog back. I don’t prefer this option for most people as training truly is a bonding experience between dog and handler, and for the best results, it best that an owner be an active participant in the training process.